Is this B25 on a bombing run? Interestingly, the answer is yes. This is from an event in St. Charles, Missouri called a Pumpkin Drop where a target is setup and pumpkins are dropped on it all day. The plane with the closest hit, wins. 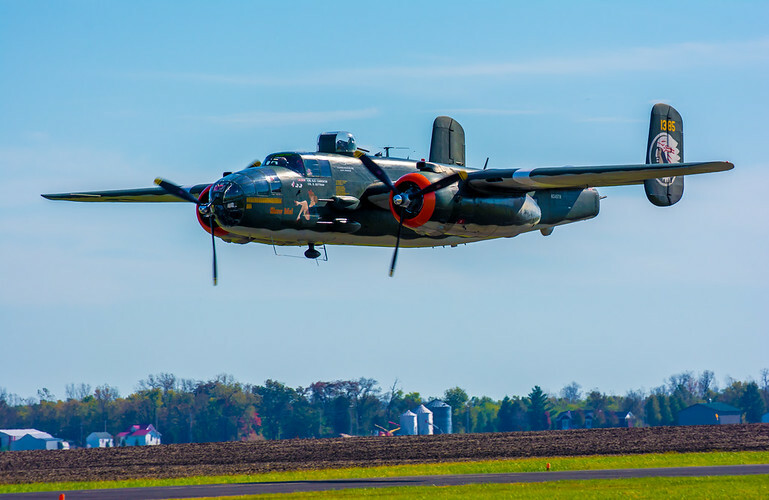 Fortunately, the airport where this event is held houses a wing of the Confederate Air Force which houses this B25 and a few other vintage military aircraft. On the day of this event you could attend for free, walk around the planes and out near the runways. It was a great opportunity for photographers! Click on this image to see it in my Smugmug account or click here to see the whole gallery: https://greatrivers.smugmug.com/Events/Pumpkin-Drop/. Be sure to see on a large screen and click the triangle at the top of the page to see the slideshow.